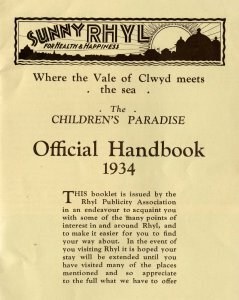 Rhyl Official Handbook, 1934. DD/DM/1307. Summer is here, and after suffering a long wet winter, the annual summer holiday now seems well within reach. Some of you may be heading abroad for some tropical sunshine; however many are opting to stay nearer home, as the staycation becomes increasingly popular. Are you thinking of heading towards the Denbighshire coast this summer? Why not visit our tourism department pages to find out more on what the beautiful Denbighshire coast has to offer? 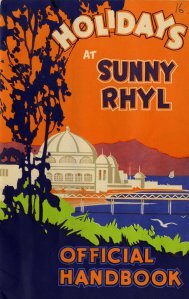 This 1934 brochure publicising Rhyl and the surrounding area, visually displays the ample facilities and entertainment it had to offer the tourist 70 years ago! Take a nostalgic look back into the past of this popular tourist town.